This brightly colourful and cheery arrangement is sure to make anyone's day. 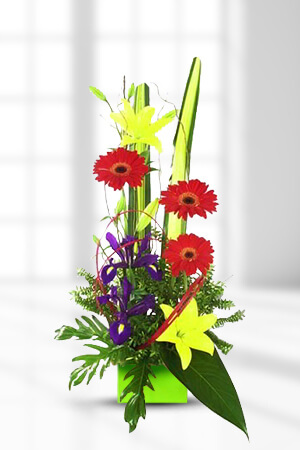 It is simply a great arrangement for any occasion. Send Sunny today to someone you wish to congratulate or cheer up.Lilies may be sent closed/partially closed in order to prevent damage and to last longer.Vase not included however; send a double surprise by adding a Premium Vase to perfectly complement Sunny. At first the experience was not great because the flowers were delivered a week before the date of delivery, and then things were made good because a second bunch was delivered at no cost. Thank you for your great service. I will keep your information for the future. Your website is awesome - so easy to use and great to be able to see exactly what we will be sending. Good getting the update via email on the delivery - thanks for that. I don't send a lot of flowers - but zFlowers.com is definitely my only choice when I do simply because we can see what we're sending - and there are so many price options - and I've recommended zFlowers.com purely based on these two things. Thanks! My Mum and Dad were rapt with the flowers. They said the flowers were very fresh and the arrangement was terrific. Receiving the flowers made their day special. Very easy to use the website and make the purchase. Loved the fact that an email is sent to advise when the arrangement has been delivered. Will definitely use again.